Dave Seger and Spencer Strauss burst into primetime with this action-packed stunt spectacular in July 2012. What began as an epically choreographed action show soon became a Channel 101 phenomenon, taking the title of Channel 101's longest-running show from 'Everything' and winning multiple Channy awards along the way. 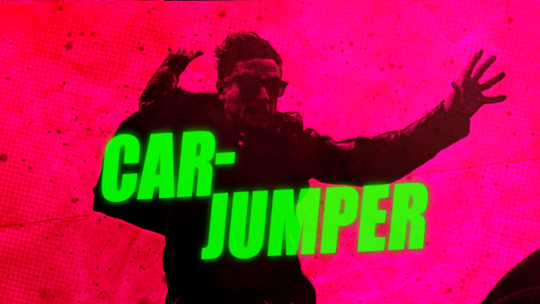 Car-Jumper survived almost three years in primetime, even carrying on despite the departure of its star Jim Klimek, but finally ran out of gas in a March 2015 bloodbath that took three primetime shows down. Long live Car-Jumper! CJ accepts the mother of all missions. Car-Jumper undergoes a radical transformation. Car-Jumper's exploits enter a new dimension. Car-Jumper's battle with the rogue Car-Surfer Gang continues. Car-Jumper uncovers shocking secrets about his past. A PR disaster leads Car-Jumper to make changes. Car-Jumper is forced to play a sadistic game. Car-Jumper tackles a crime boss from a strange yet familiar neighborhood. Car-Jumper tries to mix business and pleasure with a dignitary in town. Car-Jumper races to solve a string of murders while breaking in a new team. Car Jumper's faith is tested by an old enemy. Car Jumper must go on a journey of the mind in pursuit of Jagsaw. A new enemy puts Car Jumper to the test - will he succeed or wipe out? Car Jumper seeks revenge against Bedlam for the slaughter of his team. A new team member piques Car Jumper's interest. Car-jumping is just one of the serious issues tackled in episode two of David Seger and Spencer Strauss's action show.